Diet Going for a Toss on Weekends? 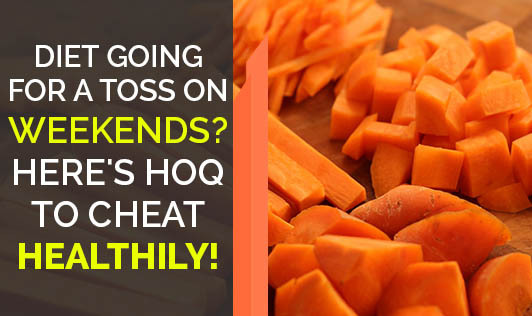 Here's How to Cheat Healthily! You are on a diet...strict, very strict. But, you follow it from Monday to Friday only. On the weekends your schedule is chilled out and so is your diet. Let us take a quick look at how can the weekends be made healthier keeping the fun as it is! Don't get up too late in the morning. Instead keep some time for a nice cozy nap in the afternoon. Never skip your breakfast. Have some yummy dish which you don't or can't eat on the weekdays. Remember not to choose anything fried. Eating out for lunch/dinner? Eat anything you want. Just watch your portion size. Carry a couple of fruits or some carrot slices with you. Munch as much as you want! Carry water with you. Do not forget to sip it after every half an hour at least. Preparing some new recipes at home on weekends will help to break the monotony of the weekdays' diet pattern. Try 2 new recipes with 2 new ingredients per weekend. Go for trekking or cycling. Choose walking over auto rickshaws wherever possible. Take up a fun book to read...helps to charge you up for the coming week! Clean up your house...it burns a lot of calories! Relax...be proud of yourself for following the diet rules without compromising on the enjoyment!